Most mornings find me seated with a decent cup of coffee at the local dog-friendly cafe. My dog likes the social aspects of laying (mostly) beneath the table where people often seek her out to pet her, even tucked in against my feet. On colder days she’s also a welcome foot-warmer for me. It’s a great place to call my morning office. The baristas are pleasant and funny and know how to make the perfect espresso and the place is very dog-friendly. Because of this last aspect, there are a variety of people who often bring their dogs to the place and most are well-trained and kept on short leashes by their attentive owners. All that is……….. except for the dog, (and his owner) who were parked at the next table over, this morning. All calm on the cafe front. I watched in disbelief as the owner calmly roped, yes roped, the dog with a 10-foot hiking rope, to her backpack. She then proceeded to set out a water bowl, (decent of her) and a bowl of dry food, (food? Really?) and then she blithely walked away to make her purchases and fix her coffee to her liking. I know her dog. I know my dog. And neither dog is one who does well around an open bowl of food should another dog choose to head in too closely. Did I mention that she’d parked herself right where the line for coffee forms so that anyone coming in, whether they have a dog or not, will have to walk fairly close to her dog and its food? Not a great idea. 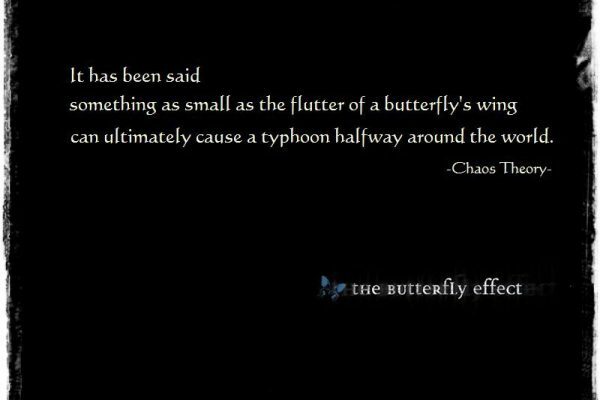 The butterfly effect is, in layman’s terms, “the scientific theory that a single occurrence, no matter how small, can change the course of the universe forever”. In this cafe, this morning, I could see how her concentration on the well-being of her dog had led her to a sort of tunnel-vision when it came to the larger world existing around her. All it would take was one dog, getting a tad too close to that bowl of food, for there to be a dog-fight. She could change the course of 30 people’s day simply by placing that food down so close to incoming customers, and man was she ever unaware of her actions. My point is that we each have the power everyday to make choices that can create change for ourselves and for others. Often without realising it we have the power to change the whole morning for a whole lotta people, and that’s something to think about. Whether we see it or not, we each get that choice every single day. Every morning, every minute, every time we step out of our houses to go do anything, and actually every minute we stay in our houses we also have choices that we make that shape the rest of our day. The key is to see that we have a choice each moment we are alive. The power is in knowing that while we may not always like the choices we have, we do have choices. When we become aware of the possibility of choosing we step into our own power and the more often we do that, the more we build our own strengths. If we want to change the course of how our day is going, want to change how others are perceiving their day we need to wake up to what choices we are making and to be aware of the world around us. So what do you choose the next time you have a choice? And I mean what do choose to create, or do in the next minute, and the next, and the next… And the next?